Volunteer\'s Park. Cnr Pt. Lonsdale & Grimes Rd. 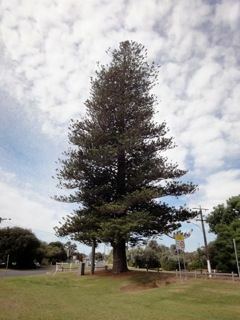 Planted at the turn of the 18th century by the Head Master of the Point Lonsdale primary school. It is in good health and is an iconic landmark for the town. The Borough of Queenscliff and the volunteer group called the Christmas Tree Committee, rig it with decorative lights and the lights are on activated on the fist Saturday of each December.